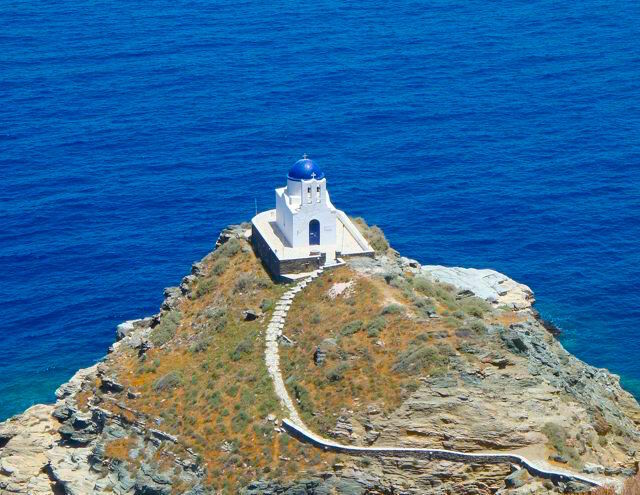 Kastro is one of the most facinating and mysterious places on Sifnos. The town has been inhabited for over 3000 years and was at one time the capital of the island. 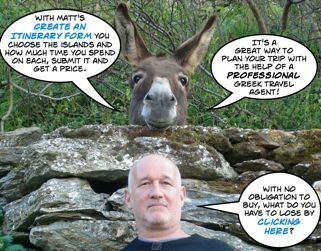 To get to Kastro you can take a bus from Kamares or Apollonia or by car or motorbike. There is also an old footpath from below Artemona which is a beautiful walking trip due to the abundance of wildflowers and interesting plants and the fact that it is entirely downhill. 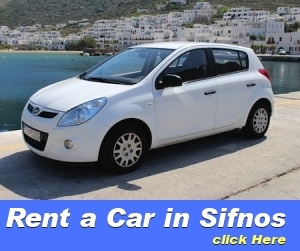 When you drive to Kastro you park in the small parking area outside the village and follow the signs to the entrance. There are no cars within the village or motorbikes for that matter. If you arrive between the hours of 2 and 6pm you may not even see a single person on the street unless it is another tourist. At the entrance of Kastro there is the old Elementary School of Kastro, which no longer operates as a school though during the summer it host various exhibitions. 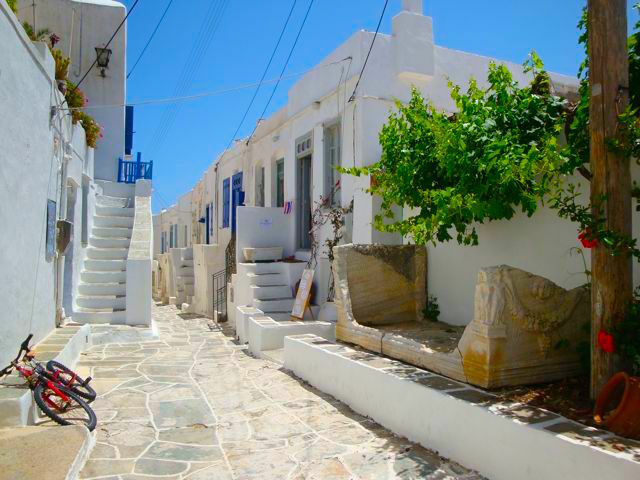 Leonidas Taverna, also near the entrance of the village specializes in traditional Sifnos food cooked by Kyria Maria. The town is rich in antiquities and besides having an archaeological museum, there are artifacts scattered throughout the village. This is an ancient sarcaphagus, one of several in Kastro. 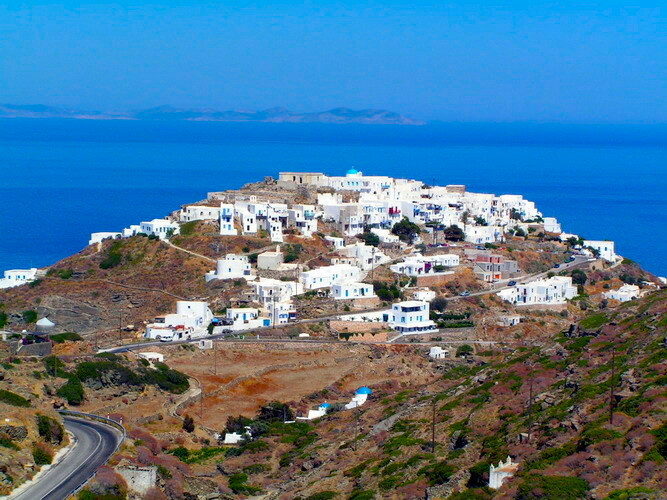 The white-washed village sits upon a domed rock that towers above the sea. To protect the town from pirates there were only five entrances in the massive walls which enclosed it. These could be locked by iron gates. When you enter the town you go through tunnels and passageways into a labrynth of tiny streets wide enough for only two or three people to walk abreast. There are cafes, restaurants and several interesting old churches. If you follow the main street to the left you will eventually come out at the sea with a stunning view of the coast. As you continue to walk around the village with the Aegean below you, the ancient walls and the ruins of the Venetian fortress are above you. On the sea side of the village are two small beautiful churches. The Church of the Seven Martyrs on the left sits above one of the finest spots for snorkling on the island. Many people think this is the church from the wedding scene in Mamma Mia. It might as well have been. From the tiny church of Saint Nicholas you can see Folegandros, Sikinos, Antiparos and Paros. In the valley and the hills around Kastro there are several churches and the remains of ancient columns scattered around. The twin churches in the valley below the town are a popular subject for the many artists who visit the village. Actually Kastro is the type of place that would have the most appeal to an artist, poet, writer or even a monk. Most tourists come here long enough for a beer or a soda and then visit somewhere else. But many of the people who do stay in Kastro end up coming back. The port of Kastro is known as Saralia and has a couple fish taverns that few tourists know about. Captain Sifakis Fish Taverna advertises fresh seafood caught from their own fishing boat and Captain George's is known for his ouzo mezedes. The beach is great for swimming and snorkling, especially when it is rough in Kamares. That generally means it will be calm in Kastro on the other side of the island. It is a pretty small beach though and rocky and not many people use it. Those who do are generally the people who are trying to get away from other people. If you follow the dirt road on the opposite side of the village you will come to the small church of Poulati and beneath that is another very nice place to swim, usually visited primarily by locals, a small stony beach and a natural spring. There are rooms for rent in Kastro which are available through Aegean Thesaurus, most of them traditional houses. Aris Houses are comprised of six separate housing facilities detached from each other; all were built about a century ago and restored in 1989 to original specifications. 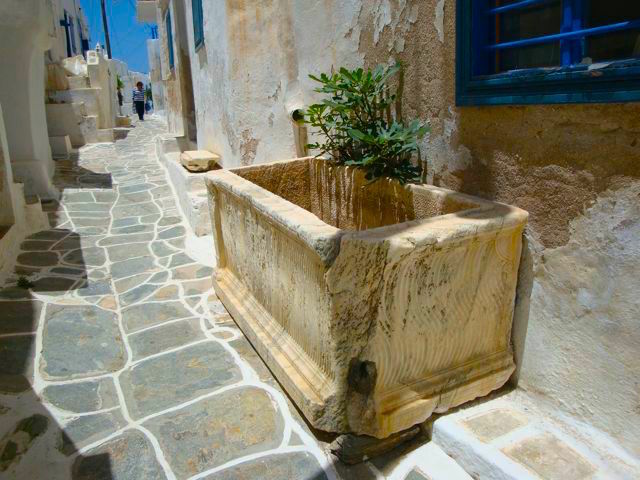 Located on the stone paved pedestrian footpaths of Kastro, they are prime examples of original Kastrian architecture (stone floors, wooden ceilings, low entrance doors, asymmetrical walls, etc.) Katigianna House is located in the center of the village on the stone paved pedestrian footpaths of Kastro, in a very quiet neighborhood. This is a two-story detached house with an interior staircase, a good example of original Kastrian architecture, and is suitable for up to 5 persons. Upstairs there are two air-conditioned bedrooms. The bedroom with the double bed has a balcony with limited side sea view and view of the surrounding village. On the ground floor there is a large living room with a TV and two sofa-beds, an equipped kitchen, and a bathroom. Gerofinikas Hotel is located on a side road, 1 km. before the village with a great panoramic view of Kastro and the ocean. 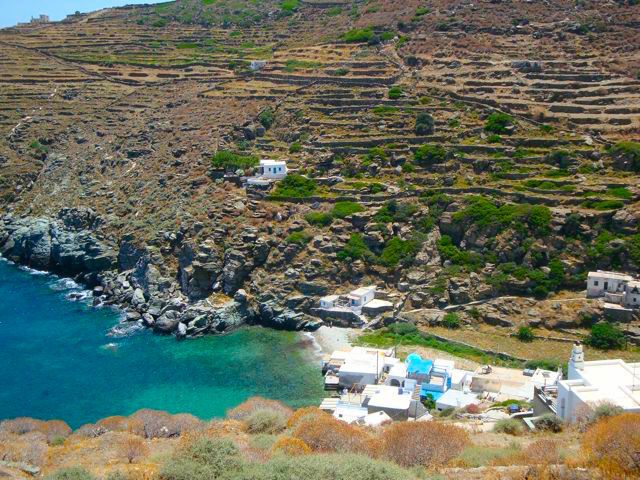 If you are looking for solitude on Sifnos then Kastro is the place to stay.